On the 2nd of June 2003 an artpiece was send to another planet for the first time in human history. 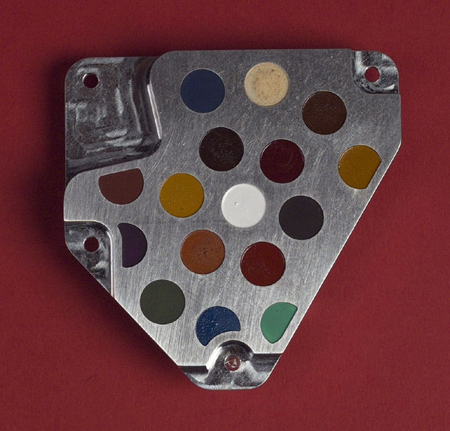 The painting, by Damien Hirst, consists of 16 multi-coloured spots on a 5cm by 5cm aluminium plate which was bolted to the lander, which was send to Mars . It had to cope with the cold of Mars, where temperatures drop to minus 70C, and pre-launch sterilisation which heats the painting to 155C. Every part was designed to be useful. The aluminium plate was used to calibrate Beagle 2’s X-ray, the colours will check the camera, and minerals in the pigments would correct the sensor measuring the soil’s iron content. 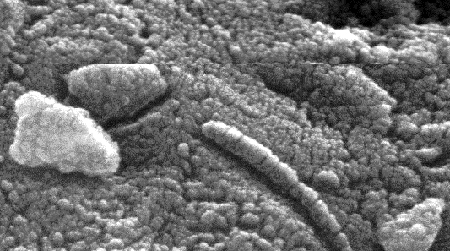 Beagle 2, named after the famous exploration-ship of Darwin, was launched on board the European Space Agency Mars Express craft from Kazakhstan. Before Mars Express enters the orbit of Mars, Beagle 2 will be jettisoned and bounce to the planet’s surface, cushioned by inflatable bags. It will analyse sub-surface soil and rocks and take samples of the atmosphere to find out if life ever existed there. Just a few inches across and resembling a child’s watercolour paint box, the trademark Hirst spot painting was bolted to the British Beagle 2 space probe after a preview at London’s White Cube gallery. In 1958, the United States Congress created the National Aeronautics and Space Administration, or NASA. Its purpose was to coordinate and conduct all aeronautical and space activites for the United States of America, except those of the military. Among the many programs which NASA now runs, one is the search for life outside our home planet. NASA is currently examining our neighbor planet Mars for signs of life, as well as the moons of other planets in our solar system. It has also developed highly advanced technology for the search of life outside of our own solar system, such as special radars and infrared telescopes. For decades, debates have been common and fierce as to whether life existed on our closest eighboring planet, Mars. Many believed that other beings, Martians, did indeed exist, and were highly intelligent. Others claimed that there was no proof of this, and that life as we know it was, in fact, not possible due to the extreme conditions of the Martian environment. 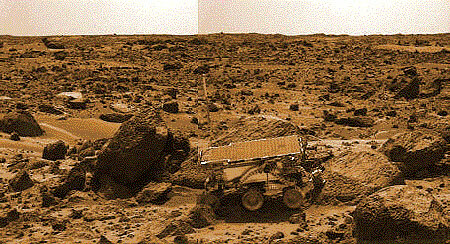 In 1976, NASA sent two landers, Viking I and Viking II, to the surface of Mars to determine if life did indeed exist. However, when these landers executed their experiments, they showed rather convincingly that there were no organic compounds above the one part per billion level in the upper few centimeters of the surface. The landers also reported on the extreme environment of Mars, with temperatures falling to 120o Fahrenheit (48.9oC) below 0 at night. So, for a while the debate subsided surrounding the existence of life on Mars. In 1996, a meteor was found in Allan Hills, Antarctica. Upon examination, it was discovered that this meteor, which is 4.5 billion years old, fell to the earth 13,000 years ago, and possibly contained evidence of life on Mars. Inside the meteor, along tiny cracks, scientists found evidence of what many believe to be ancient bacteria. There are four main clues which bring some scientists to this conclusion. One is that the meteorite is definitely of Martian origin and that it contains carbonate globules. The second is the presence of polycyclic aromatic compounds, which are complex organic molecules. The third piece of evidence is the presence of iron and other compounds which appear to be like those made by bacteria. The last, and perhaps most intriguing , is the pictures of the possible fossilized bacteria themselves. When taken separately, these pieces of evidence probably wouldnt amount to much. But what is compelling is that all of these pieces of evidence occurr within millimeters of each other. However, skeptics still remain. Some simply arent sure, while others are certain that this meteorite contains no evidence of former life.. However, all agree that convincing evidence would contain proof that the fossils had cell walls, that the cells had been divided, and that chemicals more closely related to living organisms as we know them be found. And so, the debates continue. While these debates over ALH84001 occur, the science community continues its pursuit in finding signs of life, extant or extinct, on Mars. On July 4, 1997, a small spacecraft dropped onto Mars and tumbled to a stop. This pod, sent by the Jet Propulsion Laboratory in Pasadena, California, will be examining and doing tests on the Mars surface. This pod, called Pathfinder, will be sending signals back to Earth concerning the atmosphere and soil. It has also deployed a small land rover, similar to radio controlled cars. This rover, called Sojourner, has been testing the Martian rocks for their minerals. In 2002, testing will be done on a different Mars probe to see if organic compounds or amino acids are present.If it finds amino acids buried in the surface, it will be testing to determine the chirality of the molecules. If they are homochiral, then that would be strong evidence that life existed at one point on Mars. If the amino acids are racemized, then it will be difficult to determine if they originated from life. In the next several years, NASA will be sending more space craft to Mars, to continue in its quest for extraterrestrial life. If you saw the movie Contact, written by Carl Sagan, you saw a lot of people with headphones listening to static coming from outer space. Then suddenly, one person is lucky enough to receive a signal from intelligent beings elsewhere in the universe. This may seem farfetched, but real people have actually been doing this for a living. In 1959, a magazine article by Coccini and Morrison ignited widespread interest in the idea of searching for signals sent by intelligent beings in the universe. It was not until 1971, however, that the first international Search for Extraterrestrial Intelligence, or SETI, meeting occurred. One year later, Oliver and Billingham, in a paper called the Cyclops Report, layed out five main points as to why an organization should be formed to officially handle the SETI issue. The conclusion that Oliver and Billingham came to in the Cyclops report was that a SETI institute should be created as an ongoing part of the total NASA space program, with its own funding and budget. In 1976, the first institutionalized SETI program within NASA was created as the SETI Program Office at Ames Research Center. In 1977, JPL created a SETI office. Originally, the goal of SETI was to detect signals from outer space. To accomplish this, giant radar dishes were designed and built. 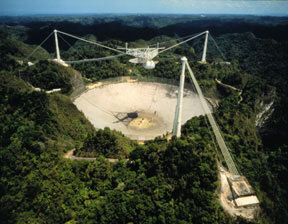 In Arecibo, high in the mountains of Puerto Rico, a 305-meter radio telescopeis used to detect signals and survey the sky. Its goal is to search for 800-1000 solar-type stars which are within 100 light years of the Ames Targeted Search Element. The goal of JPLs Sky Survey Element is to observe the entire sky with smaller, 34-meter telescopes. When the project is completed, it will have cost more than $108 million. (Possible Mini Chem Window detailing the Cyclops report which sparked interest in SETI) The first item in their paper was that planetary systems were common, and that our solar system was in no way unique. Their second point was that many of these planetary systems contain at least one planet which is in the habitable zone. Oliver and Billingham also pointed out that, as shown by experiments by Miller and others, the organic compounds needed for the beginning of life may be formed in large quantities. The fourth point of the Cyclops Report was that stars typically have a life span long enough to support the evolution of life. Their last point was that if biological evolution did occur, then intelligent life would evolve. Source: Mars Global Surveyor Narrow Angle Camera in July 1998. The target area lies in the Cebrenia quadrangle of Mars and is centered on 33.25° latitude, 238.6° longitude. 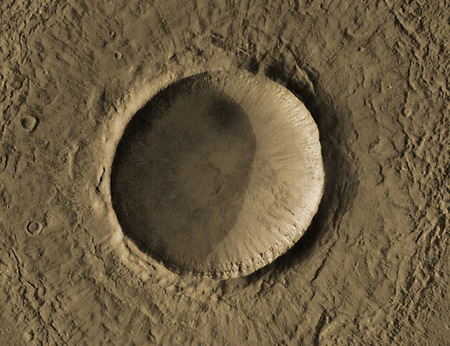 The crater is approximately 4 kilometers in diameter. You are currently browsing the archives for the Areology category.